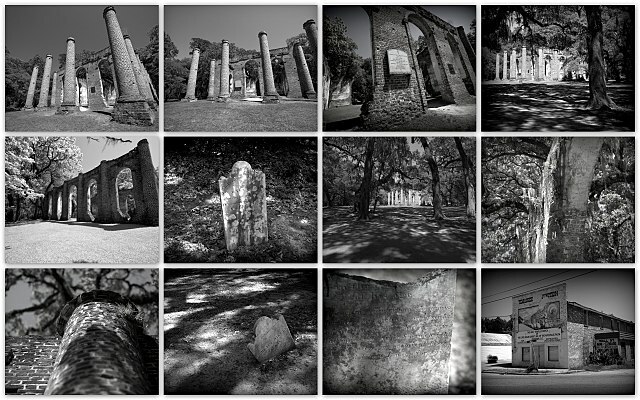 Some ruins are magnificent only because of the divine mystery that radiates from them. Even when there are many proven facts for a story, the unknown pieces of the puzzle will often gather the most interest. 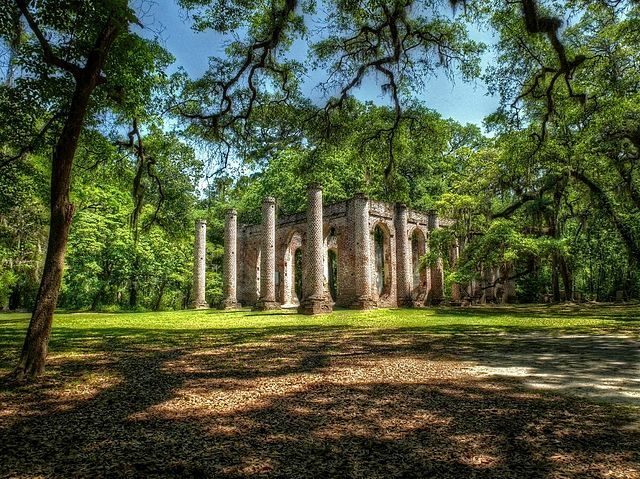 Old Sheldon Church is a decaying beauty that silently speaks for itself. 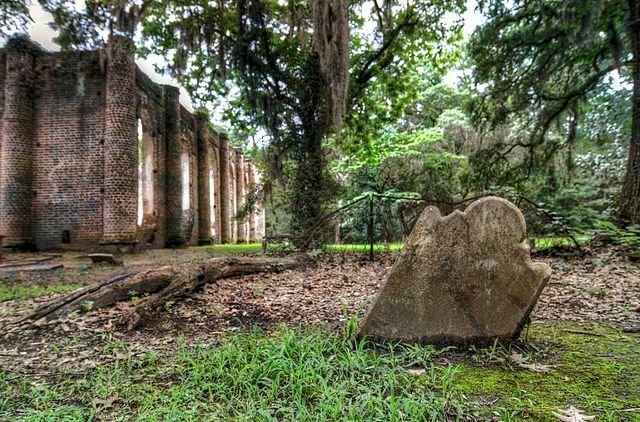 The site is located on Old Sheldon Church Road in the rural area of Sheldon in Beaufort County, South Carolina, approximately between the city of Beaufort and the town of Yemassee. 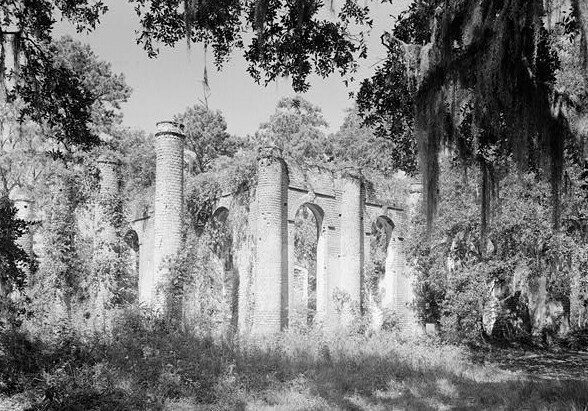 The ruins of Sheldon Church. Today, this old church building is sadly only a roofless, empty shell. Its pediment, gable roof, extravagant windows, and interior have disappeared many years ago. Even though its majestic grandeur has gone forever, it still has much to say. 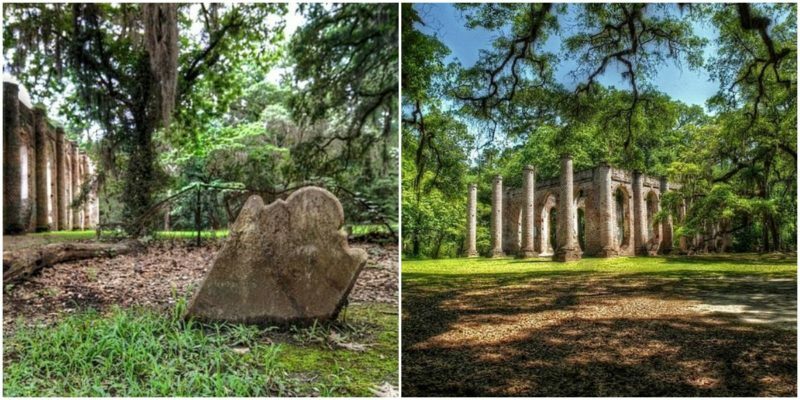 It is hidden by flowering plants and large oak trees, which give an additional flavor to its already picturesque appearance. 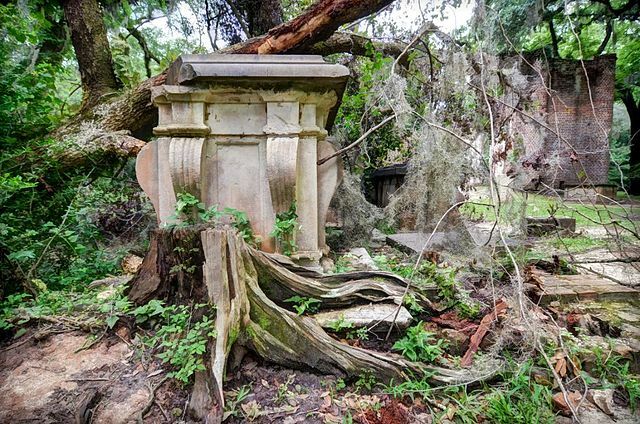 Many old graves are also scattered around the remaining walls, adding some spookiness to the location. Sheldon Church was constructed from 1745 to 1755. It was completed in 1753, but some minor details were added over the next two years. It was known as Prince William’s Parish Church and officially began hosting religious activities in 1757. 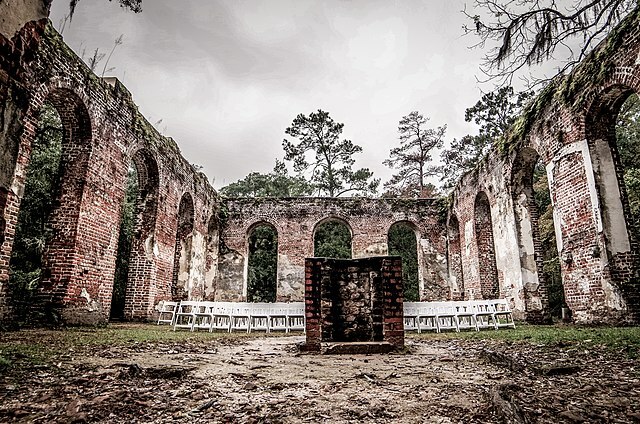 Some believe that it was the first church in the United States of America to have intentionally been built to look like a Greek temple, although this assumption is questionable because it is not backed up with any valid documentation. However, details that can still be found clearly suggest that the imitation of a temple was intended. If not the first, it was without a doubt one of the first structures in the United States to be constructed in Greek Revival style. The initial money for construction was given by Lt. Gov. William Bull I (1683-1755), who is buried in the church grounds. In the course of the Revolutionary War (the American Revolution), the church served as a strategically important military and political site. Additionally, the Bull family burial chamber was used for hiding gunpowder, ammunition, and arms. As a result of this, the site was targeted by the British. 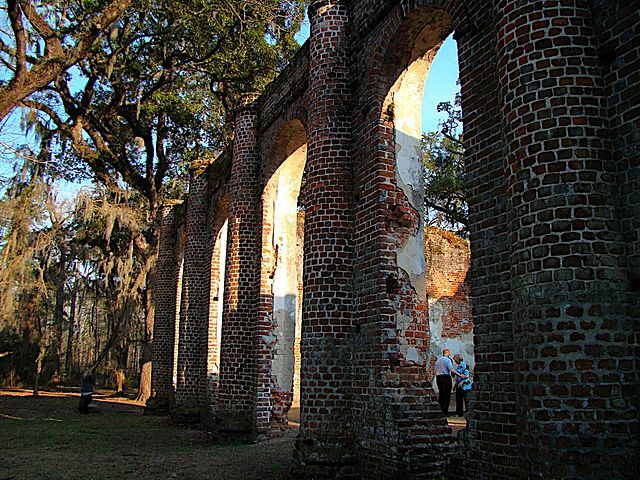 In 1779, a great part of the church was burned by the British army, led by General Augustine Prevost. 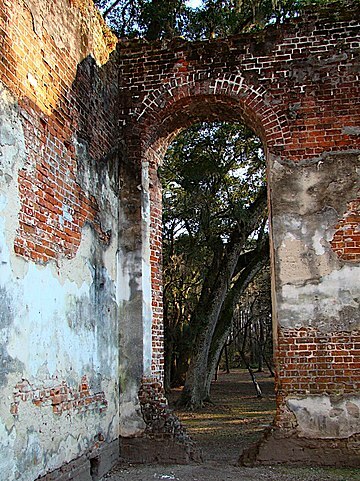 For the next 40 years, the structure was left abandoned and in a ruinous state. Reconstruction started in 1825 and complete renovations were carried out within just one year. In 1826, the site was opened again with its interior and roof rebuilt. The new church was modeled more or less on the old one. It was rebuilt around the original 3-foot-thick brick walls. 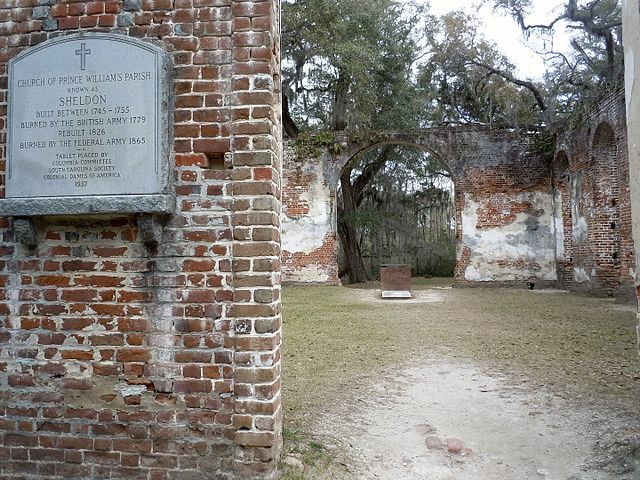 Prince William’s Parish Church acquired a new name after the renovations — it was popularly called “Sheldon Church” after the nearby Bull’s plantation. The plantation house was named after the Bull family home, Sheldon Hall, in Warwickshire, England. 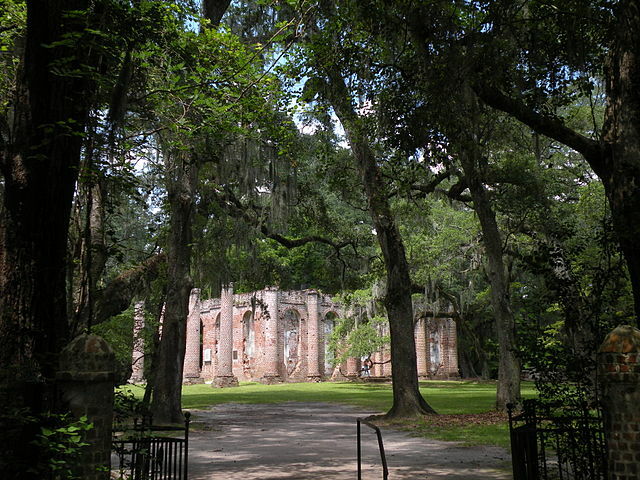 The church is believed to have been set on fire again in February 1865 during the American Civil War. The fire is said to have been started by Union troops who were marching at the time from Georgia into South Carolina. It is quite possible that the interior was demolished by the soldiers and that any useful material was later taken away by locals and used for reconstructing the houses that suffered the fatal march of Sherman’s army. Exactly who was responsible for destroying the church and the events of that period of history could well stay an unsolved mystery for a long time, even forever. One thing is for sure and that is that since the end of the Civil War, the church was left abandoned and slowly crumbled. 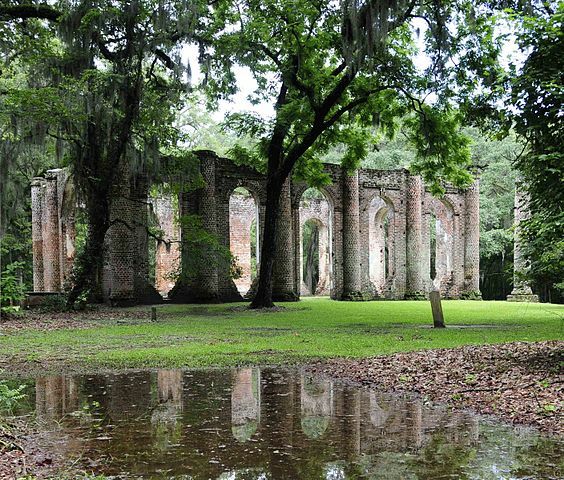 Today, the site is a publicly-owned property managed by St. Helena’s Church in Beaufort. It is frequented by visitors who come to enjoy the tranquil and enchanting surroundings.